This is 18 month old Jacob as a Fish! 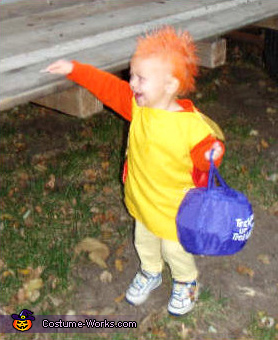 His Mom Tricia says the costume is totally Homemade. Without even a PATTERN! The fishes tail wags each time Jacob takes a step, I was sent a short video to attest to this fact but I am sorry to say that I can't get it to go on my site. You'll just have to take my word for it I suppose Ü The wag is VERY cute! Although a tad blurry this pic shows the tail better. Great Job Tricia and thanks!